Why not have the sheer joy of doing for yourself so you are crystal clear on how you want your life to unfold in the next few years? You will have clear concrete steps and supports articulated to ensure it happens. All in 3 hours! Then you can offer this gift to friends, family, colleagues and groups. A side bonus is building your graphic and visioning skills. Choose a time where you can give your full attention to the process? Make sure it is quiet where you are? Make sure you have a good internet connection where you have good audio and good ability to speak? Bring some colored pens or markers and a large sheet of paper to the session? Please email Barbara with a minimum of 3 dates and times that are convenient to you. Note: Graphic coaching session starts 30 minutes before each planning session. This is optional but will greatly enhance the beauty of your PATH. We can also send you written tips of doing graphics if you cannot join early. Choose an option that fits you! Looking for a group session? 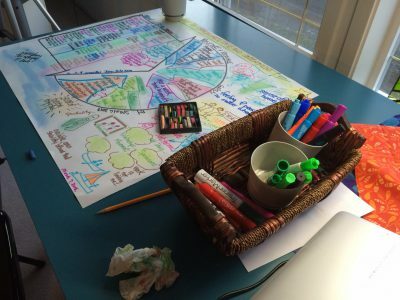 When you only have a half day to “kick off“ a planning effort, this short and powerful graphic planning process is excellent for individuals or groups about to begin a project or explore a new life/work direction. This exercise achieves great motivation and focus for groups and individuals who want to focus only on the next 12-24 months, as opposed to the typical five year strategic planning effort. It does not replace the strategic planning process but can be used to as a “stop” gap measure if your time or budget is limited, or you are focusing on only one specific aspect of your organizational mission. It is excellent as a team building exercise. It also works very well for couples or families who are in a transition phase of their life or career. Email us directly for a quote.